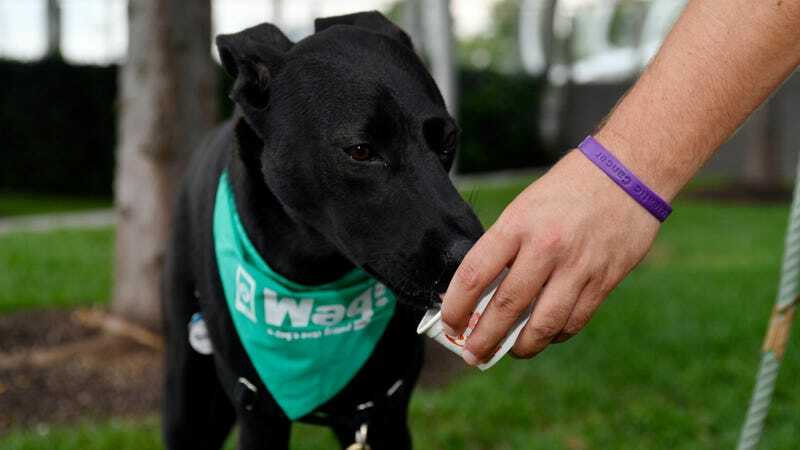 Dog at Wag event on Tuesday, August 7, 2018 in Washington. The so-called Uber of dog-walking apps, Wag, has found itself in the dog house after one of its walkers appeared to physically assault a dog under his care in security footage. The dog’s owners are now raising concerns over the vetting process behind the platform and others like it, Fox-affiliated KTVU reported Wednesday. The couple checked their home surveillance video from Dec. 17, the date of the last walk. The video recorded Vaurus showing up to their home with four other dogs. Wag policy clearly states that customers’ dogs are given “a one-on-one experience,” meaning Vaurus was already in violation of company policy. ... In an e-mail, Vaurus told [KTVU] that the dog bit him and he “needed to test Ollie and make sure he understood who the pack leader was.” Over the course of about 12 minutes in the surveillance video, Vaurus is seen chasing Ollie around the house, growling at the dog and kneeing the animal’s chest. Video appears to show Vaurus kick and whip Ollie with a leash. Fulks now says the app should be conducting regular background checks on dog walkers who are not only responsible for handling pets but have access to customers’ homes. In the case of Fulks and Brown, they were made aware of the apparent misconduct only because of security cameras. Similar concerns were raised by CBS News in 2017, when a Wag walker was reportedly captured in security footage lounging in a client’s apartment for hours before allegedly taking the client’s dog out for less than 10 minutes rather than 30. The dog’s owner was reportedly tipped off by the animal’s odd behavior, at which time he checked cameras in his home. Vaurus was reportedly barred from the Wag app, and KTVU reported that Vaurus was charged with misdemeanor animal cruelty last week by the Contra Costa County District Attorney’s Office. But Fulks told ABC-affiliated KGO that it was days before the company followed up with her and more than a week before the company looked into the footage of the incident. “It just surprised me when it comes to something like animal cruelty—which is against the law—that they wouldn’t respond more,” Fulks told KGO.